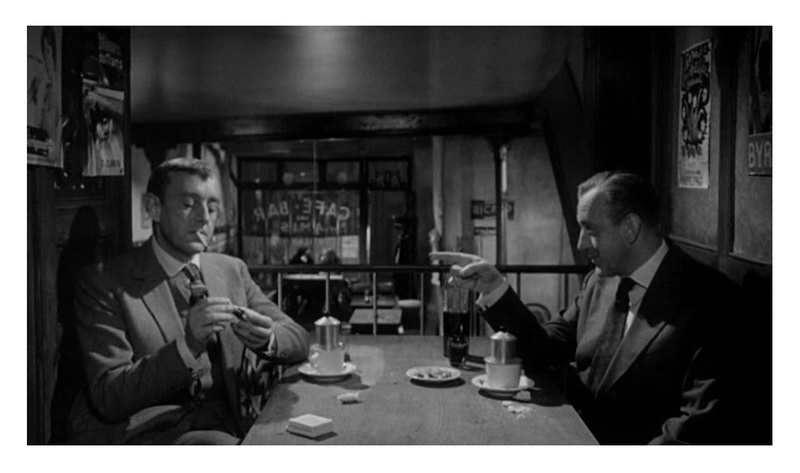 A lonely British scholar, John Barrett (Sir Alec Guinness, The Bridge on the River Kwai), meets a French nobleman, Jacques De Gué, (also played by Guinness), who is his exact lookalike. Because of their uncanny resemblance, De Gué tricks Barrett into taking his place. At first Barrett plays along, but then he realizes that he is just a pawn in an elaborate murder plot. Cinema has had a love affair with British author Daphne du Maurier. Her books and short stories have been adapted to the screen numerous times. Alfred Hitchcock alone made three films based on du Maurier’s works (Jamaica Inn, Rebecca and The Birds). I’ve only read her short story The Birds (it’s part of du Maurier’s 1952 book The Apple Tree) and I liked her writing very much so I should make a bigger effort to read her other books. 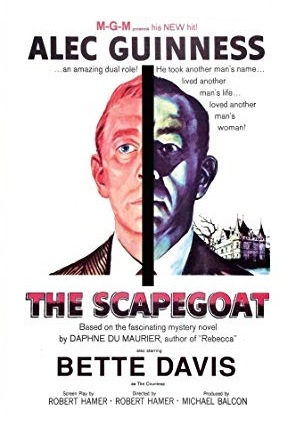 The Scapegoat is based on du Maurier’s 1957 novel of the same name. It was produced in England by Michael Balcon (The 39 Steps) and distributed in USA by MGM. Author du Maurier was allowed unprecedented input during the making of the film. Balcon listened to du Maurier’s suggestions (it was her idea to cast Alec Guinness). She allegedly demanded multiple changes and I wonder if this is the reason the film is a bit of a mess — this is my least favorite movie based on one of du Maurier’s works. The film was co-written and directed by Robert Hamer (Kind Hearts and Coronets), a talented director who had a serious alcohol problem. Sir Guinness directed some scenes when Hamer was found to be “indisposed.” The film looks good, but the half-cooked script leaves a lot to be desired and the film is a bit on the slow side. Guinness is effective in dual roles. I’m a fan, so you won’t see me trash him. However, I have to say that this isn’t one of his best performances. Guinness does an adequate job here, nor more, no less. There are other good performances in the film. I particularly liked Irene Worth (Deathtrap) as Guiness’s wife and Geoffrey Keen (Moonraker and For Your Eyes Only) as Guiness’s faithful butler. Bette Davis has three scenes that amount to 11 minutes of screen time. She plays Guinness’s drug-addicted mother. It’s the most interesting character in the movie and it’s disappointing that she isn’t explored in more depth. Davis claimed her role was supposed to be much larger and the choppy editing during her scenes supports her statement. Davis’s presence feels like one big tease that doesn’t pay off. The Scapegoat was a commercial and critical failure. It cut off Guinness’s wings, who was flying high after his Oscar-winning role in The Bridge on the River Kwai. Writer du Maurier was very displeased with the results. For Davis, it reinforced the public’s perception that her film career was over. Years later, Davis admitted that she thought it was all over. She had, of course, a few tricks up her sleeve. The movie was remade in 2012. B&W, 91 minutes, Not Rated.